as a community of believers, we are interdependent pilgrim Church, united in love and working for integral evangelization with a faith that does justice. -to build and promote communal bonds with people of other faiths and cultures. -Strengthening of the religious life. The Archdiocese of Taunggyi where the evangelization works started by PIME Missionaries in the early 19th century, primarily belonged to the Diocese of Taungngu. As the mission territory was far distant and the number of believers was considerably increasing, it was established as a Diocese by Pope John XXIII in 1961, as a Suffragan to the Archdiocese of Yangon. Msgr. J. B. Gobbato, PIME, was elected and ordained as its first Bishop on May 21, 1961 in Rome. Msgr. Matthias U Shwe was consecrated as his Auxiliary Bishop on December 13, 1980. In 1989, the diocese of Loikaw was established by Pope John Paul II carving the southern portion of the territory of Taunggyi and Msgr. Sotero Phamo was made its first bishop. In 1990, Bishop J.B Gobbato retired and Msgr. Matthias U Shwe succeeded him as Ordinary of Taunggyi. In 1998, the diocese was raised to the archdiocese and Msgr. Matthias U Shwe was made archbishop by Pope John Paul II and installed archbishop by Msgr. L. Bressan, Apostolic Delegate for Myanmar. In 2001, Msgr. Peter Hla was made auxiliary bishop of Taunggyi archdiocese. In 2005, Pope Benedict XVI established the new diocese of Pekhon carving the southern portion of the archdiocese. The new diocese of Pekhon was inaugurated and Msgr. Peter Hla was installed as its first bishop on 1st April 2006 by Msgr. S Pennacchio, Apostolic Delegate for Myanmar. The Holy See nominated Msgr. Basilio Athai to be Auxiliary Bishop of Archdiocese of Taunggyi on June 29 2008. Msgr S Pennacchio, Apostolic Delegate for Myanmar consecrated Msgr. 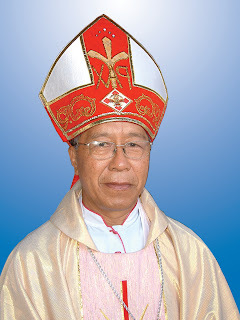 Basilio Athai as Auxliary Bishop of Archdiocese of Taunggyi on 18 Nov. 2008. Taunggyi Diocese is situated in the Southern Shan State, on the Eastern part of Myanmar. It was established as a Diocese by Pope John XXIII in 1961. There are 18 townships in the Diocese. Buddhism is the predominant religion whereas Christianity, animism and a few other religions form the minority. Civilly, the Diocese is comprised of 2 zones, namely Loilem Zone and Taunggyi Zone, and canonically 2 Vicariates: Taunggyi Vicariate and Loilem Vicariate. There are 12 parishes in the Archdiocese: 8 parishes in the Loilem vicariate, 4 parishes in Taunggyi Vicariate. The Diocese was raised to Archdiocese by Pope John Paul II in January, 1998 officiated by Msgr. L. Bressan, the Apostolic Delegate. The Bishop Emeritus J. B. Gobbato, PIME, was called to the Lord on August 6, 1999, and entombed in Taunggyi Cathedral. Msgr. Peter Hla was appointed Auxiliary of Taunggyi Archdiocese on May 10, 2001 and was ordained Bishop on December 15, 2001 by His Excellency Msgr. Adriano Bernardini, the Apostolic Delegate to the Union of Myanmar. Msgr Basilio Athai was appointed Auxiliary of Taunggyi Archdioces on June 29, 2008 and was ordined Bishop on Nov 18, 2008 by His Excellecy Msgr S. Pennacchio, Apostolic Delegate for Myanmar.